Well…after teasing you with my little lamp update and the new cornice, I’m finally ready to reveal the lighter and brighter powder room! I didn’t want to repaint the walls. I didn’t want to spend the $$$ to replace the vanity. I wanted to bring some blue in the room. The whole project was kick-started when I found these plaques at Target. And the little Ikat patterned bowls at World Market. Both the bowls and the plaques contained all of the colors that I wanted to incorporate into this room. 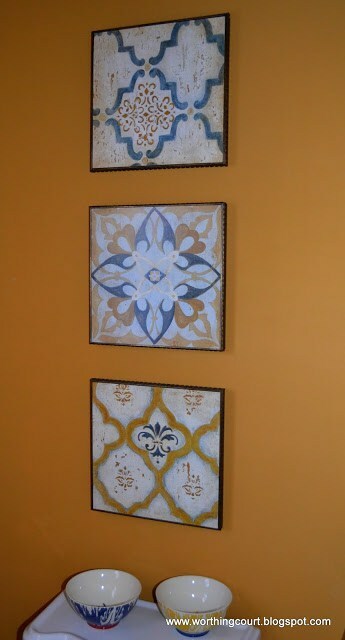 Plus, I love the interest that is added to a room when patterns are mixed together. From there, things just seemed to come together. I stole a little blue and white lamp from another room and gave it a quick update by changing the shade to a more modern shape and adding ribbon to it. 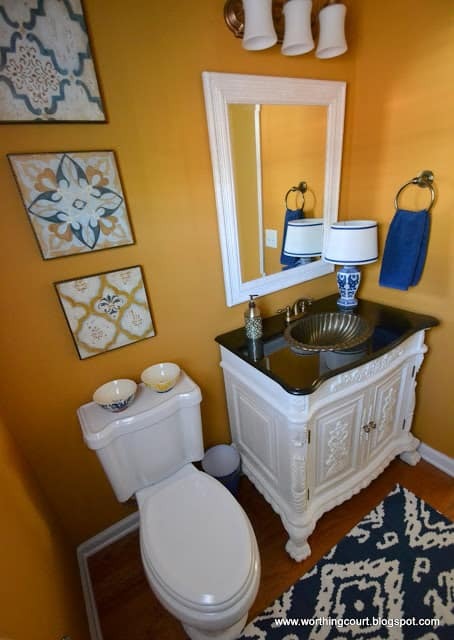 The vanity was painted with Annie Sloan Chalkpaint in Pure White. After giving it a coat of clear wax, I added just a teeny-tiny bit of dark wax. A tip for you – if you are painting a piece with chalkpaint that has received a lot of handling, wipe it down with mineral spirits prior to painting. This step will remove any oils left on the piece from skin contact that could create a problem with paint adhesion. I’m a big fan of using calendars for inexpensive wall art! I found this gorgeous one at Calendars.com. It was a few dollars more than the others, but it is printed on heavier paper and every single image is beautiful. I purchased a couple of very affordable 16×20 frames at Christmas Tree Shops ($9.99 each) and pre-cut navy and white mats. 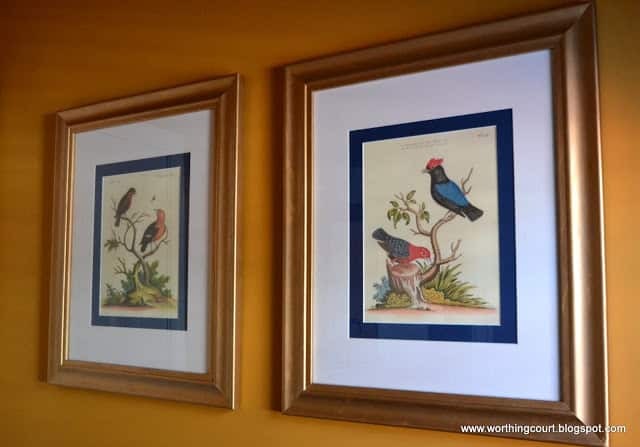 The frames were dark brown, but after giving them a couple of coats of gold spray paint and some Antique Brass Rub n Buff, this is how they turned out. I think they fit right in with the fabric that I used on the new cornice. A friend found the navy and white flat weave rug at TJ Maxx/HomeGoods. I love the mix of all the patterns in this room. Okay – how about some before and afters? I kept the same light fixture (above the sink), but gave it an update by “refinishing” it with Antique Gold Rub n Buff and by replacing the shades with more modern shaped ones in pure white. 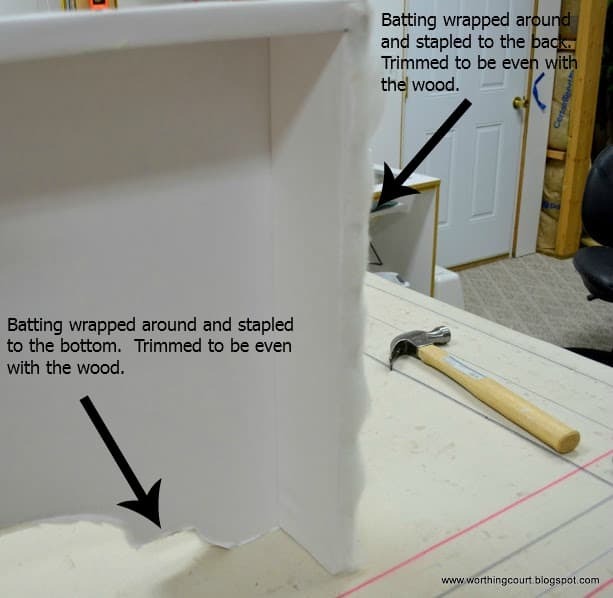 Check out my step-by-step tutorial for making this cornice HERE. 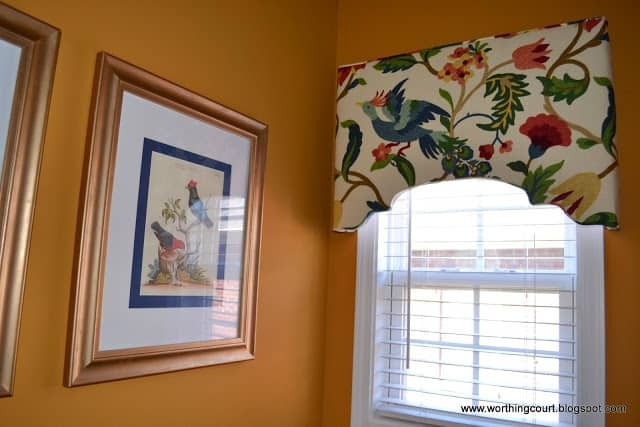 It will walk you through all of the steps necessary to make your own upholstered cornice. You’ll get professional results that your family and friends will think you paid hundreds for. 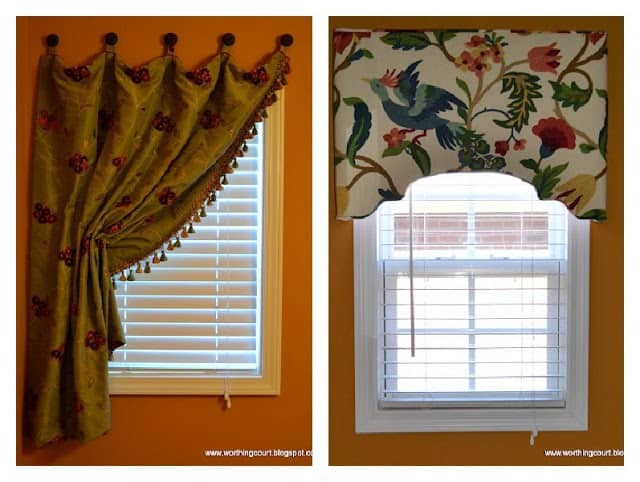 If you’re looking for something more simple, check out this tutorial for a No-Sew Faux Roman Shade. Suzy, This is a fabulous, bright, upscale makeover! I love your wall color and the new colors you paired it up with. You made simply awesome choices!!! Your rug adds such a big pop of happy color! I need to remember your tip about using calendar art. Very very clever! Can you come to StoneGable and give my tips about a low cost makeover on my powder room? I love what you did. The colors are so beautiful together. Suzy, I love the added blues in here. Beautiful prints from the calender and love the plaques over the toilet. Well, Suzy, I think you succeeded in fulfilling your three requirements…and you did it beautifully! 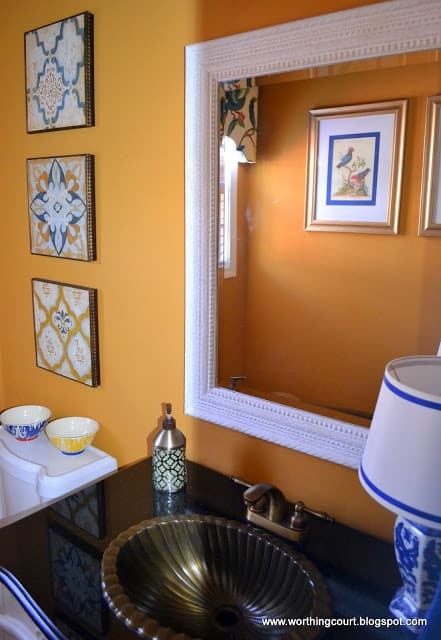 The vanity is wonderful; and your prints, plaques, bowls, cornice and rug brought the colors together beautifully. This is very pretty! Love this room. The vanity is very pretty and the curtain is just great. The rug is very pretty and goes with the room very well. Great touches. What a lovely room. Love the painted vanity, and the blue touches throughout the room go so well with the wall colour. I found you on Hometalk and I’m your newest GFC follower. It turned out fabulous, Suzy. 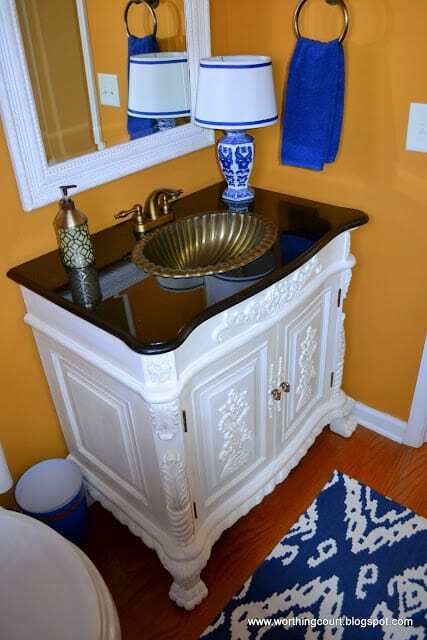 Love the addition of the blue, the vanity is gorgeous! Did the dark wax make the top dark, or was it painted dark? (I am a newbie with painting :(!) xo Looking forward to the SBC! Just a few weeks away…..do you know if RDU has lots of escalators? 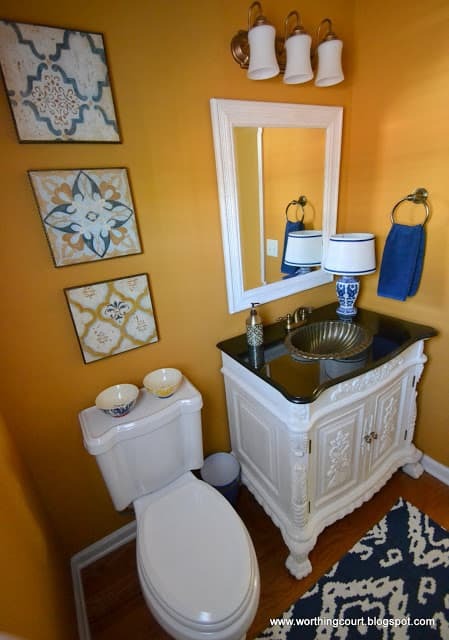 Your updated powder room looks beautiful! I love the fabric cornice board. I made them for my sons room too. Beautiful Suzy! Amazing how painting the cabinet white brought out the beautiful detail work in it! I actually loved it before, but love this one more! Great job! Great makeover. I love your rug! Beautiful!! Love those bird prints! What great bathroom! Love the bird pictures. What an awesome makeover. I love everything in the bathroom. Beautiful rug. Thanks for sharing at DIYbyDesign. 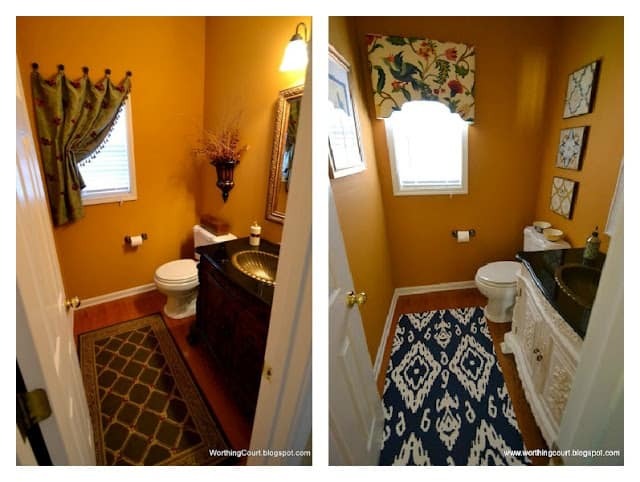 Nice job in transforming this bathroom. I think the blue addition looks really good with the wall color! great way to use the bird calendar! Fabulous changes! I think the bird pictures are my favorite (and the cornice)! Lovely! I’m loving that blue!! Great job, girlfriend! 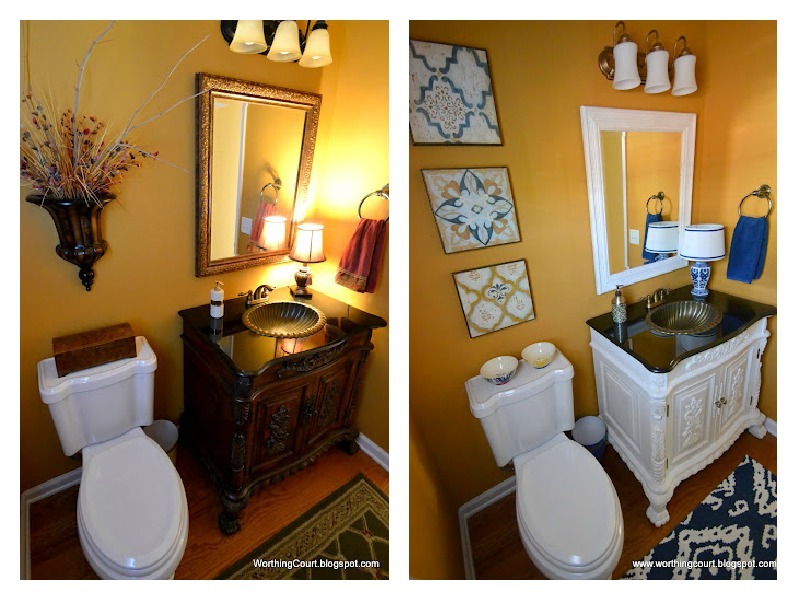 I also revealed my bathroom makeover at Savvy Southern…#66 (I also entered as #52 and #61). Glad to have found you. Time to tour your home now – ha ha! Meredith at thepolkadotshoes.blogspot.com. Come on over! I love orange pumpkins and blue and white china. I love your orange walls and blue accents. The tiles tie it all together! 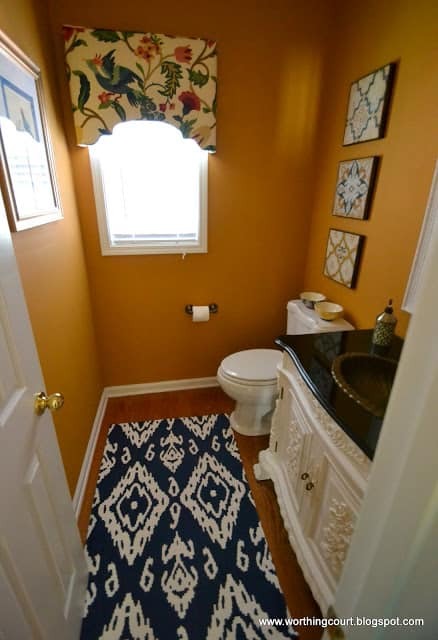 I am loving the color of your bathroom! It is so fabulous!!!! Come link up to my party and share this . Looks great! I love the vanity and all the detail it has! What a fantastic improvement! The bird/calendar idea is fantastic. I wonder if calendars go on super-cheap clearance at some point during the year? I am constantly amazed by little changes that make the biggest difference. 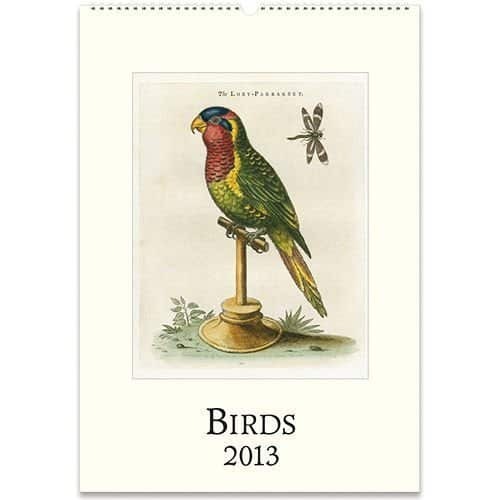 Love those birds & want that calendar now! Thanks so much for the joining “The After Party”!